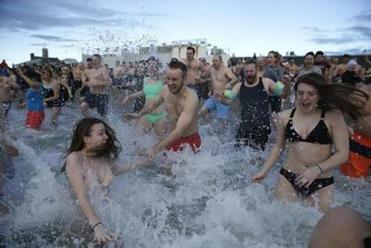 People ran into the water during the L Street Brownies’ annual New Year polar plunge. With temperatures in the mid-50s, New Year’s Day in Boston felt downright balmy. Especially since the thermometer barely cracked zero a year ago. Still, it was hardly a day to go for a swim. Unless, of course, you joined the L Street Brownies and rang in 2019 with a dip into Dorchester Bay. With temperatures in the 50s, the L Street Brownies in South Boston held their annual new year’s swim — one of the country’s oldest and most popular. Some wore funny hats and blew party horns as they broke through the start tape to plunge into water estimated to be 45 to 50 degrees. Many dressed in costume, including as bumble bees and sword-swinging vikings. Money raised from the plunge helps fund local charities, including an after-school sports program, Monahan said. 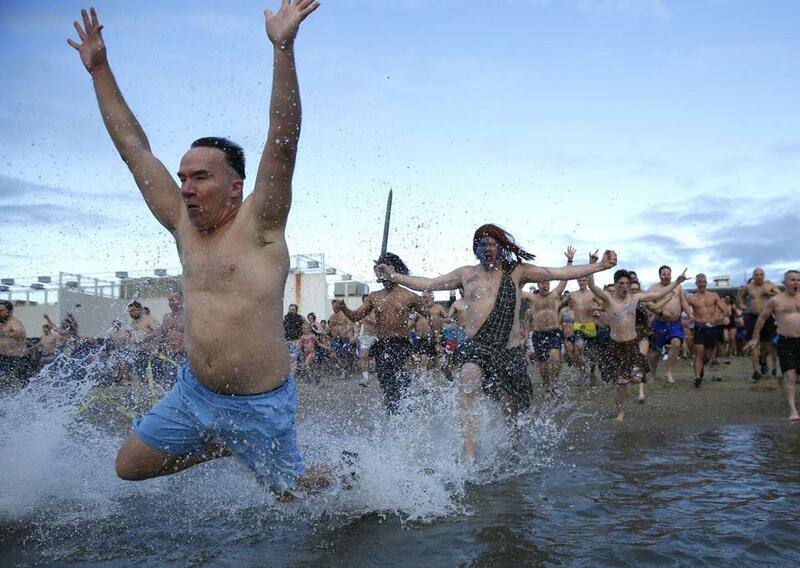 The unusually mild weather may have drawn out more first-time plungers to take part in one of the city’s oldest New Year’s traditions. “I think that people might be more willing to try it for the first time because the weather is on their side . . . of course, those of us who swim all the time, the Brownies, call that a little bit of cheating, but that’s OK,” Monahan said. Among the first timers was Richard Evans, 65, of Hampton, N.H., who decided to join the Brownies’ swim after his recent retirement. Even though 2019 was Evans’s first New Year’s Day swim with the Brownies, his ties with the group run deep. His grandfather, Richard Boland, was a Brownie, whose members swim all year. Evans had with him a photograph of his grandfather during a 1904 Brownies swim. He wanted to honor the memory of his grandfather, who immigrated from County Cork, Ireland, and lived in South Boston, Evans said. “This is a time to reflect on the passing family, and this is a great cause down here,” Evans said.